This page is for ZEBRA and DETAIL settings for the viewfinders. The Genesis has 2 separate Zebra patterns that kick in at different highlight levels. ZEBRAs are diagonal black stripes displayed in the white areas of the image, as a visual indication signal level. Zebras are rarely used in feature films. The cinematographer might use zebra patterns momentarily as a quick check on highlight exposure. Zebras only appear in the viewfinder. 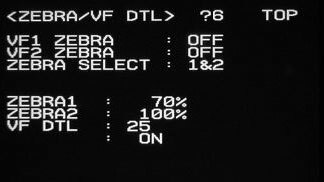 ZEBRA1 : Dial in the desired signal level for ZEBRA1. In video shoots, 70% is a common choice, to refer to skin tone at key. 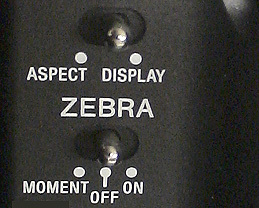 ZEBRA2 : Dial in the desired signal level for ZEBRA2. 100% is a common choice, to refer to nominal white. VF DETAIL : Dial in the Viewfinder DETAIL level from -99 to 99. ON or OFF turns the viewfinder DETAIL on or off.